The prospect of beginning a stepfamily can be exhilarating, especially because they often form in the wake of losses such as divorce or death. Couples that are successful in forming stepfamilies combine their enthusiasm with a conscious, step-by-step process that takes into account the complexity of the family structure and the diverse needs of each family member. Stepfamilies present a number of challenges for both adults and children. Conflict with the “other household”, a lack of clarity about the roles of step parents, and feelings of loss and loyalty conflict among stepchildren all can impede family harmony and cohesion. Attend to the needs of the ex-spouse and make sure that his or her family remains involved with the children. 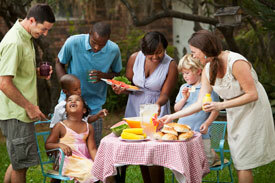 The formation of new stepfamilies sometimes re-ignites conflict with the “other household”. Giving notice to the other biological parent before introducing a prospective partner to children, reassuring the other parent that the new spouse will not usurp his or her role, and making sure that children remain involved with the other parent can all help to minimize conflict. Carefully develop the stepparent-stepchild bond. Healthy relationships between stepparents and stepchildren are crucial for stepfamily success. Children are usually more accepting of stepparents that aim to establish themselves as friends or confidantes rather than disciplinarians. As many children feel conflicted about becoming close to a stepparent, it is important that stepparents move carefully in their efforts to engage; they should be particularly careful with physical affection, and never suggest that they are usurping parental roles. Biological parents can help the relationship by taking primary responsibility for discipline, and by directing their children to act in a respectful manner towards stepparents. Give time to the couple relationship and clarify financial arrangements. Couples who begin stepfamilies are often consumed with the demands of their kids. It is important for the new couple to prioritize time for each other, by either making regular dates or taking trips without the children. It is also important for them to clarify financial needs and concerns; most couples have found that sharing their money together leads to greater family unity. Tend to the relationship between biological parents and children. Many stepchildren fear that the arrival of a stepparent will mean that they will have less time with their parent. Carving out time for the biological parent and child to spend together without the stepparent present can alleviate these fears. Stepparents can facilitate these efforts by making sure that they have social supports outside of the immediate family. Make time for the whole family to be together. While it is usually unwise for the family to embark on long trips together early on, short fun activities can enhance stepfamily cohesion. Whole-family activities usually run smoother if the couple does not demonstrate too much physical affection within sight of the children. Stepfamily life can be successful, especially if couples follow a deliberate, step-by-step process. Therapists with training and experience in stepfamily dynamics can help families pace themselves, meet the needs of both adults and children, and lay the groundwork for a cohesive and secure family environment.